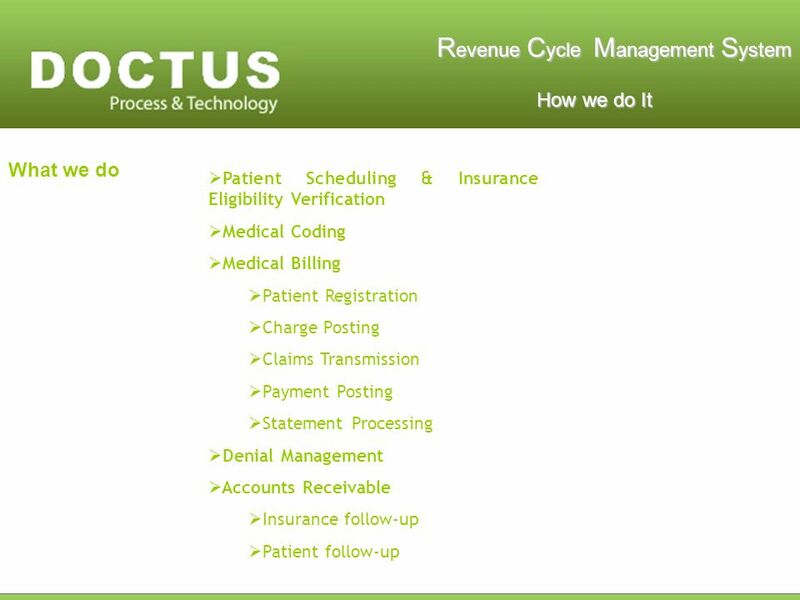 R evenue C ycle M anagement S ystem How we do It How we do It Insurance companies aim to benefit more by slowing down the process at the physicians expense! 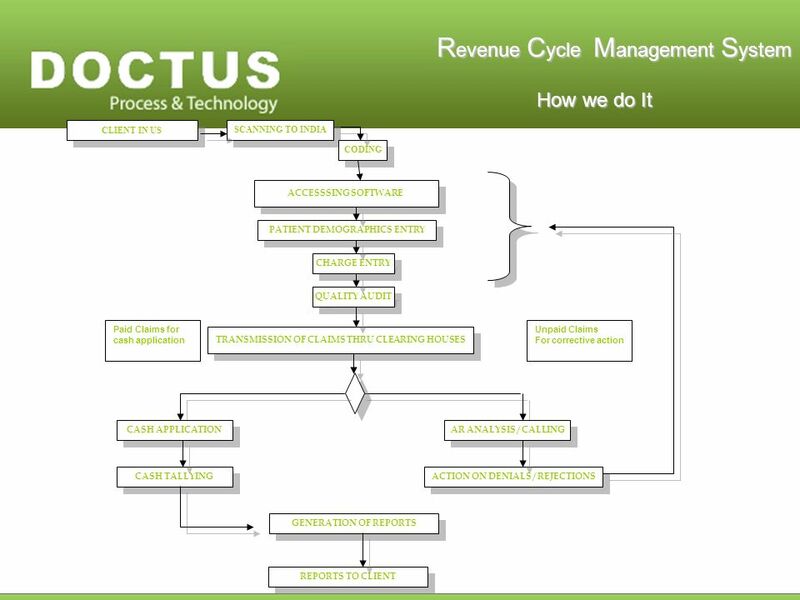 2 R evenue C ycle M anagement S ystem How we do It How we do It Profile Driven by People, Process and Technology, Doctus USA consistently provides quality motivated solutions and compounding value to our clients through outsourced Healthcare Administrative Support Services. The Doctus Team of trained and experienced professionals has actively serviced the North American medical markets for more than 7 years and is highly specialized in Medical Billing, Receivables Management, Indexing, Transcription and Digitization Services. 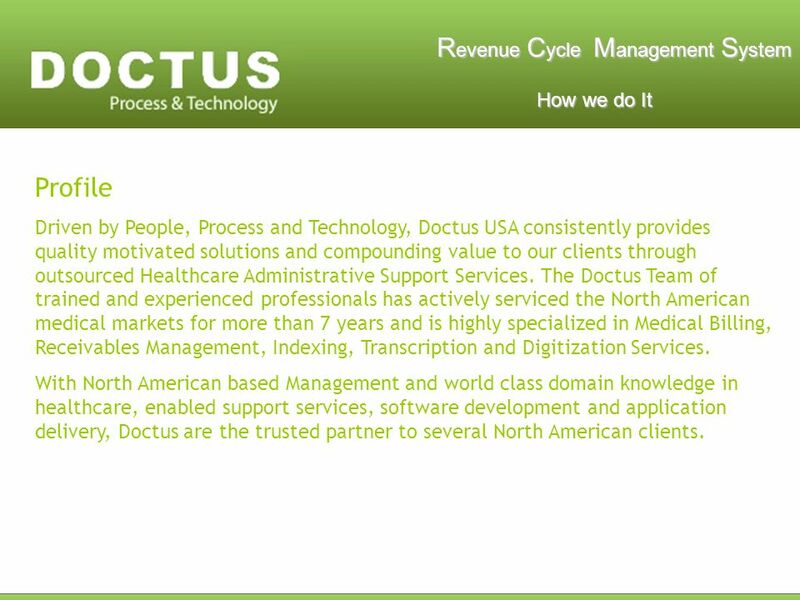 With North American based Management and world class domain knowledge in healthcare, enabled support services, software development and application delivery, Doctus are the trusted partner to several North American clients. 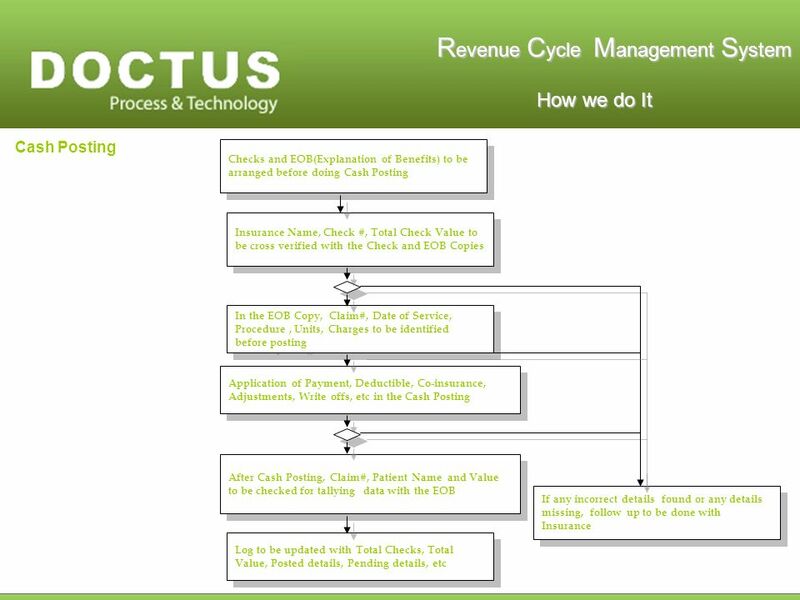 7 R evenue C ycle M anagement S ystem How we do It How we do It Mail to India on Scan date, File name and directory path. 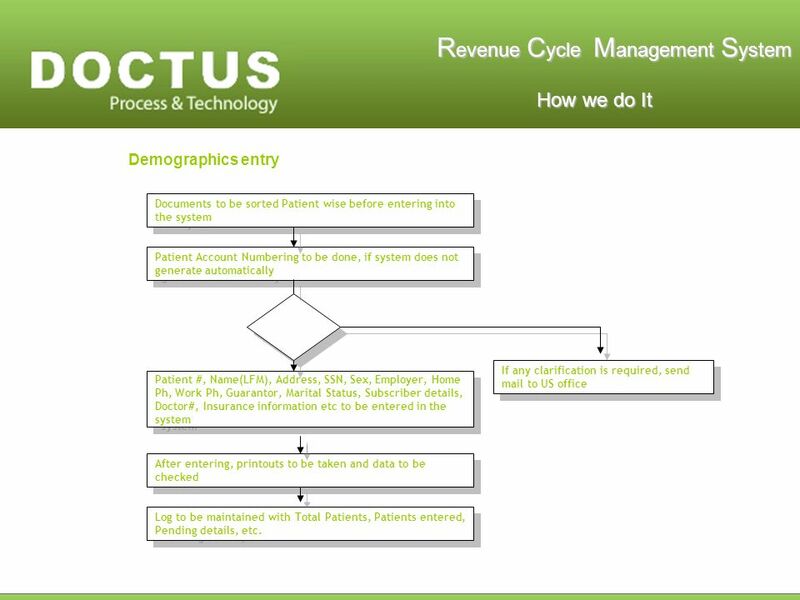 US Office scans Patient Demographics, Charge Sheets, Insurance Card Copies, etc. 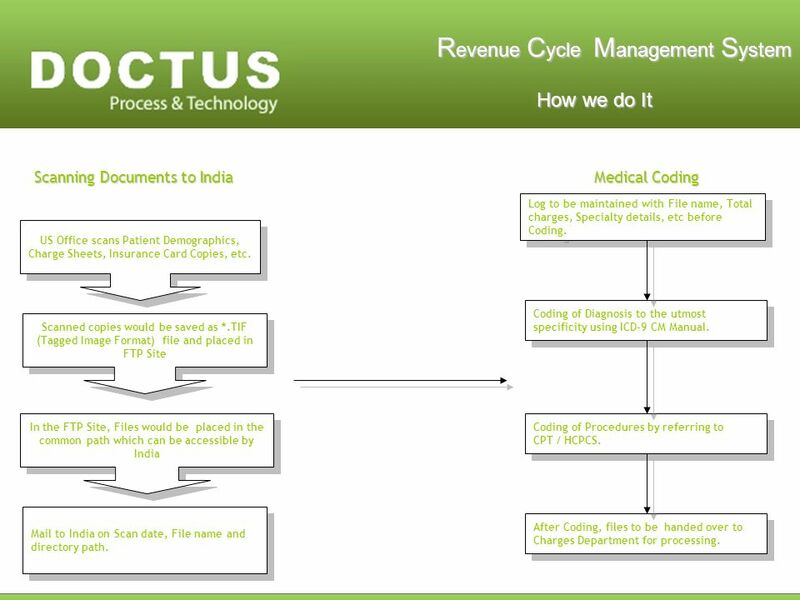 Scanned copies would be saved as *.TIF (Tagged Image Format) file and placed in FTP Site In the FTP Site, Files would be placed in the common path which can be accessible by India Scanning Documents to India Medical Coding Log to be maintained with File name, Total charges, Specialty details, etc before Coding. Coding of Diagnosis to the utmost specificity using ICD-9 CM Manual. Coding of Procedures by referring to CPT / HCPCS. 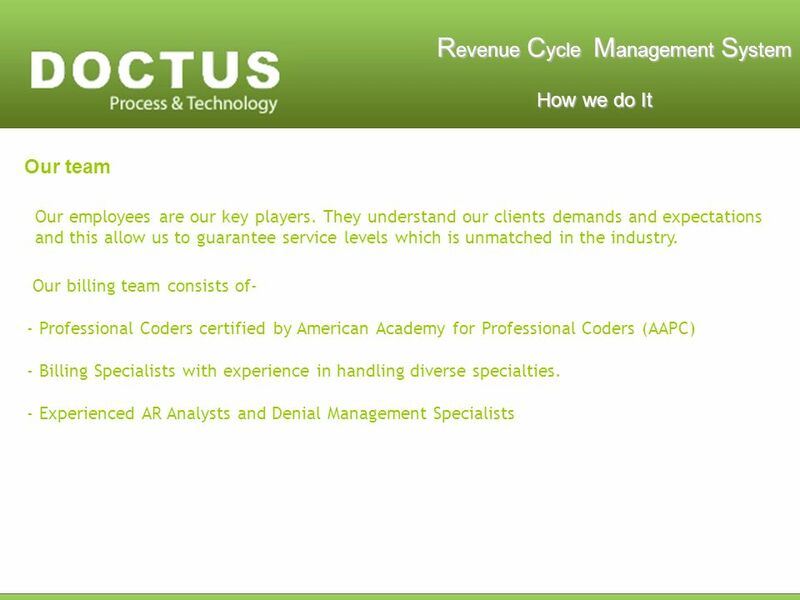 Coding of Procedures by referring to CPT / HCPCS. After Coding, files to be handed over to Charges Department for processing. 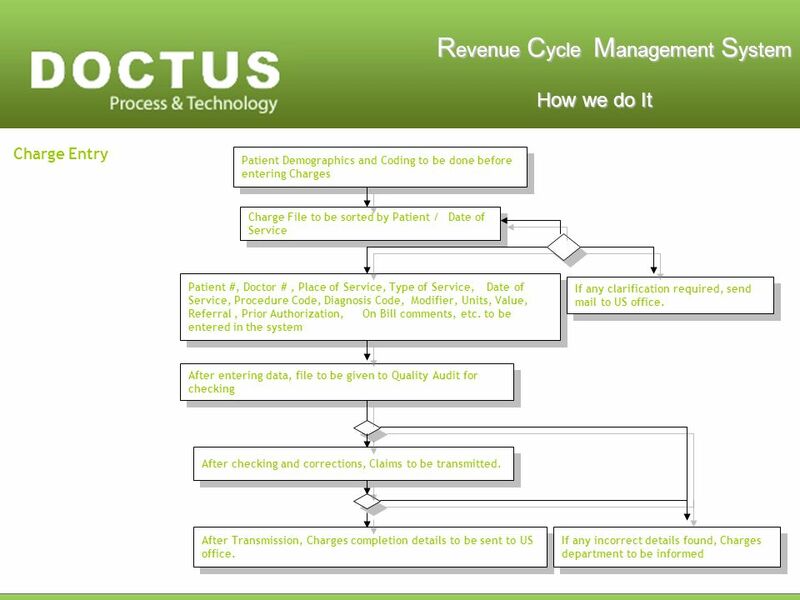 13 R evenue C ycle M anagement S ystem How we do It How we do It -Within 24 Hours on receipt of EOB Denied claims are worked on, rectified and resubmitted. -EOB is posted on the same day and All Denials which require additional documentation, are sent to the Doctors office. - we are well versed with using correct appeal procedures in knowing Healthcare Laws and we specialize in working on old Account Receivables. 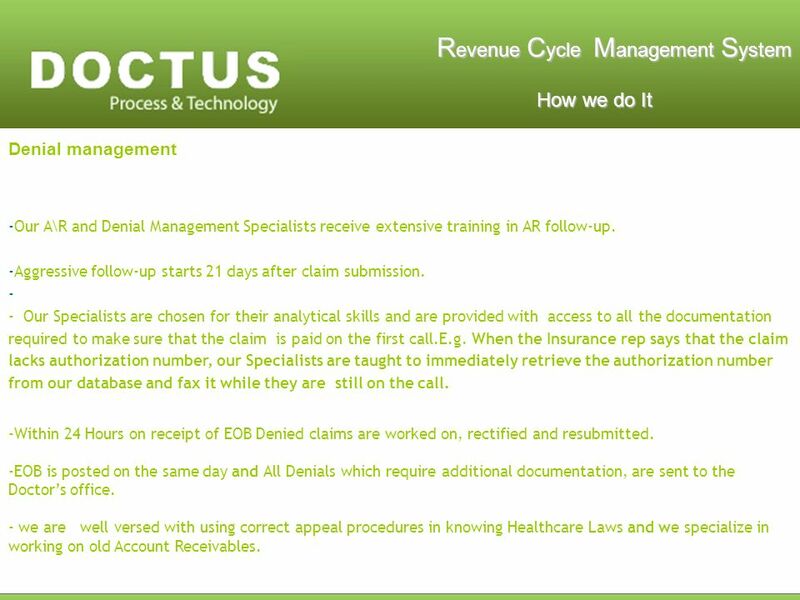 Denial management -Our A\R and Denial Management Specialists receive extensive training in AR follow-up. -Aggressive follow-up starts 21 days after claim submission. - - Our Specialists are chosen for their analytical skills and are provided with access to all the documentation required to make sure that the claim is paid on the first call.E.g. When the Insurance rep says that the claim lacks authorization number, our Specialists are taught to immediately retrieve the authorization number from our database and fax it while they are still on the call. 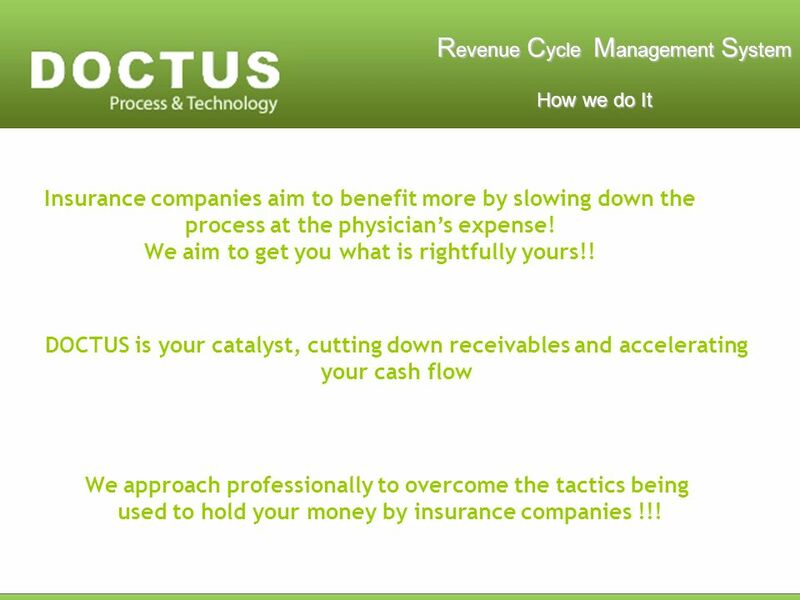 Download ppt "R evenue C ycle M anagement S ystem How we do It How we do It Insurance companies aim to benefit more by slowing down the process at the physicians expense!" DEPARTMENT OF SURGERY Cardiothoracic Surgery Dentistry, Oral & Maxillofacial Surgery, Otolaryngology – Head & Neck Surgery General Surgery Neurosurgery. 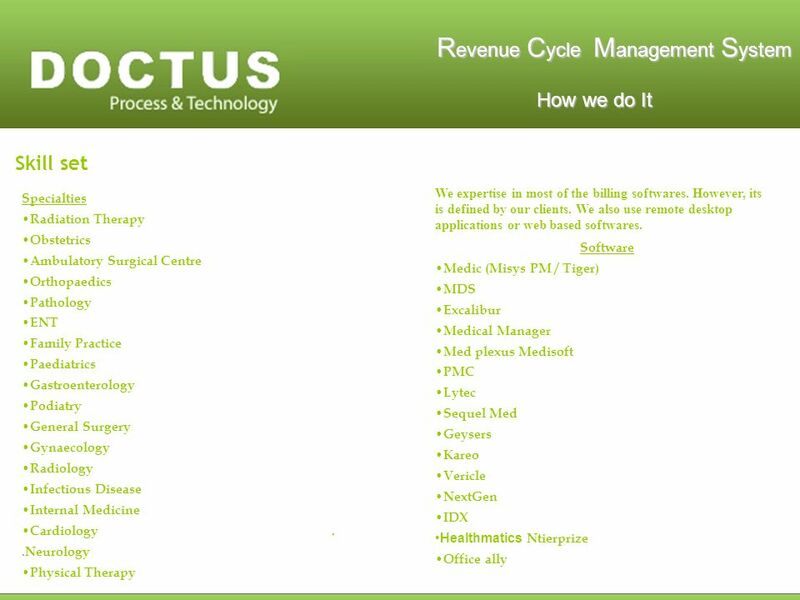 PROVEN HEALTHCARE SERVICE SOLUTIONS Medical Group Services. Claims Follow-up Claim Status Balance Billing Appeals. What you need to know about billing to Medicaid Beverly Remm Director of Billing Orion Healthcare Technology. The Health Insurance Portability and Accountability Act of 1996– charged the Department of Health and Human Services (DHHS) with creating health information. May 2008 Web interChange - Advanced Presented by EDS Provider Relations Field Consultants Insert photo here. 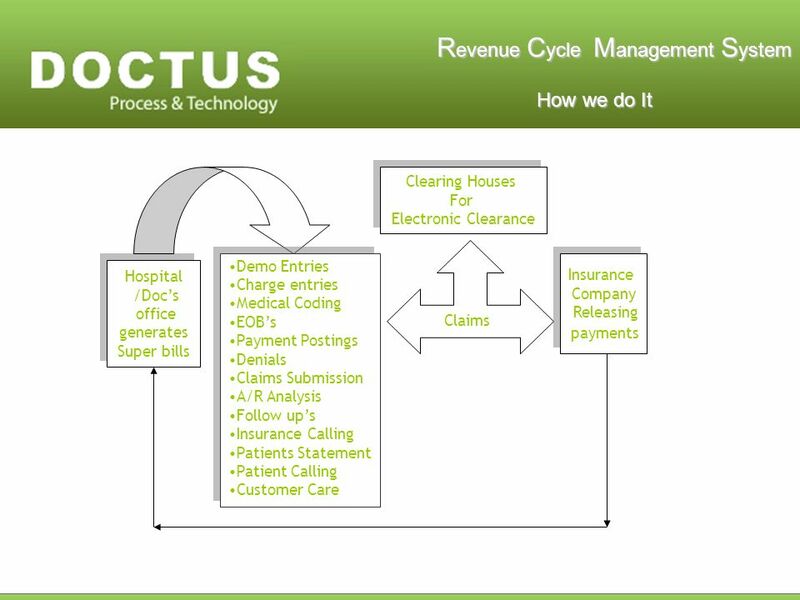 Claims Handling – Physician Office WSMA Spring Seminar March 2, 2013 Presented by: Rosalia Sabelko, RHIT, CCS-P. Copyright © 2008 Delmar Learning. All rights reserved. 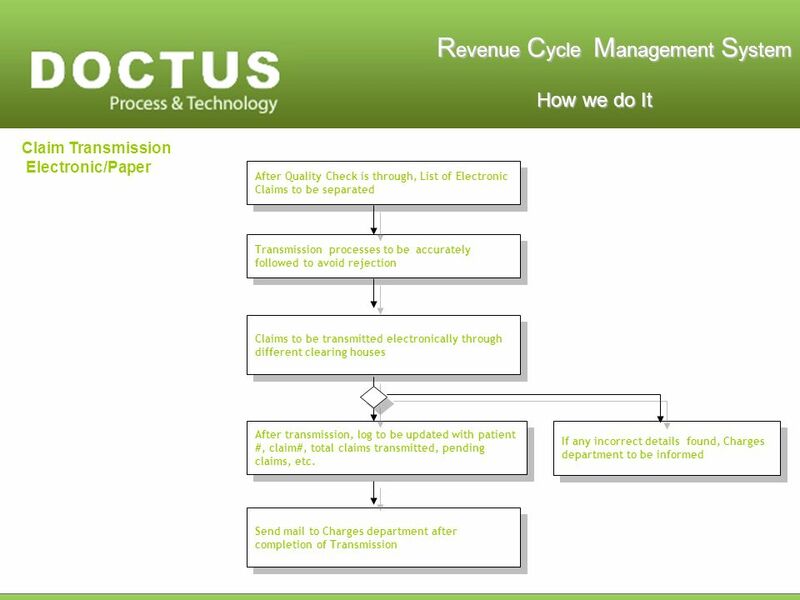 Chapter 4 Life Cycle of an Insurance Claim. 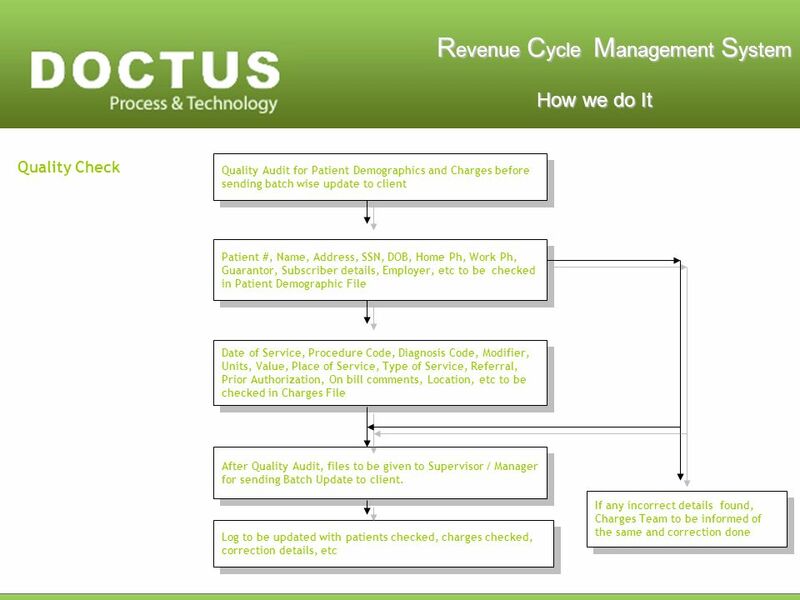 Overview Clinical Documentation & Revenue Management: Capturing the Services Prepared and Presented by Linda Hagen and Mae Regalado. Important Things to Know About Your FlexComp Plan University Systems. Chapter 36 Accounts Receivable. ACCOUNTS RECEIVABLE Money owed to the practice/doctor/office bookkeeping must be accurate done by: –Receptionist –Bookkeeper. DON’T BE IN DENIAL!. STEPS TO RESOLVE “DENIAL” Identification Reduction Avoidance.